Newcastle may be going through a torrid time in the Aviva Premiership, but one man who is clearly thriving in the Falcons environment is academy back Zach Kibirige. Still just 17, Kibirige has appeared in A league games for the Falcons on the wing and at full-back, and he is also captain of the club’s academy. A pupil at Yarm School, which has close links with Newcastle’s academy, Kibirige’s pace makes him a great attacking threat on the pitch. His speed and finishing skills haven’t gone unnoticed by England selectors, and Kibirige was selected to represent England U17 a year early, a gamble that paid off as he scored a try against France. Furthermore, whilst on tour in Australia with his school last summer, England U18s called him up to fill a gap in their team, and he played on the wing in the 27-0 victory over Australia Schools. Props traditionally develop at a later age than their team-mates in the back-line, but loosehead prop Rob Hislop seems to be bucking the trend. The teenager – he will be 20 at the end of this month – has already been named as a replacement for Edinburgh in the RaboDirect Pro12, and made appearances for the team against the likes of Cardiff Blues, the Ospreys and Connacht during the World Cup. Robin is the son of former prop Brian ‘Bomber’ Hislop, who played for Scotland B, and he has gained a lot of his knowledge of the front row from his father. Hislop, who plays for Boroughmuir if not in Edinburgh’s squad, is 6ft tall and weighs 16st 5lb, and his scrummaging technique has been highly praised. However, he’s also very mobile for a man of his size, and has a good skill-set around the park in the model of a modern-day loosehead. He has already represented Scotland in the U17 and U18 age groups, and is now a member of the U20 squad. Having played for the side during last summer’s Junior World Championship, he’s now gearing up to take on his European counterparts in the U20 Six Nations. 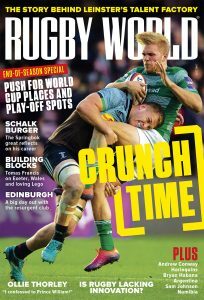 This article appeared in the March 2012 issue of Rugby World Magazine.